For many people around the world, Easter is a time for fun and celebration, whether for religious or non-religious reasons. Easter this year is less than a month away, but people are already looking forward to the usual traditions associated with Easter: Easter bunnies, Easter gift baskets, and Easter egg hunts. Among techie folks, programmers, and geeks, Easter is a year-round thing because of so-called Easter eggs that they hide in the software programs and other electronic products that they create. These “Easter eggs” are not real duck or chicken eggs. Rather, they are pieces of code hidden in software applications, electronic media (such as DVDs and sound files), computer chips, and circuit boards. The hidden Easter egg, when triggered by the right (often undocumented) command, makes the application or device behave in an unusual way. For instance, it can reveal hidden messages, perform certain functions not part of the application or device, or any other odd behavior that often surprises the user. Hiding Easter eggs in applications and devices is a tradition among programmers and engineers all over the world, often to stoke humor or simply to include information (e.g., credits, list of developers, and the like) that would not fit elsewhere in the application. With Easter Sunday just around the bend, I thought about sharing four “eggs” hidden in the world’s most popular opensource browser: Mozilla Firefox. As an Easter gift to all tech-loving folks, I’ve also included two Easter eggs from μTorrent and one from PHP. The following instructions will lead you directly to the “eggs.” These instructions have been found to work in Firefox 3+. I have not tested them in the latest Firefox 4. Ready? Start Firefox, and let’s begin the hunt. The Scroll of Honor. It is easy to find the list of Firefox contributors and developers. Just click on Help –> About Mozilla Firefox and press the Credits button. Want to see the full list as a non-scrolling page? Type about:credits and press Enter. I myself couldn’t believe the length of the list. Firefox is truly a product of many hands. Infinity in a Browser. Want to see what a browser within a browser within a browser (ad infinitum) looks like? Enter this into the address bar and hit Enter: chrome://browser/content/browser.xul then type the same address into the new address bar, then type it again into the third one that appears, and so on until you run out of space. A Prophetic Passage from the Book of Mozilla. Enter about:mozilla on the URL bar and hit Enter. The text is allegedly from the Book of Mozilla. Scholars and sages from all over the world have come up with various interpretations of the passage. To make matters more confusing, the passage seems to vary according to the Firefox version you are using. One thing is certain, though: the passage is prophetic. Hobnobbing with Gort. Ready to find a robot in Firefox? Type about:robots on the address bar and hit Enter. Want to make a wild guess about the robot’s name? The title of the page is a popular phrase from the 1951 science-fiction movie The Day the Earth Stood Still, and the first item on the bulleted list is Isaac Asimov’s First Law of Robotics, which first appeared in “Runaround,” a short story that Asimov wrote in 1942. You guessed it—the short story is about robots. As promised, here are three more eggs. The first two are for μTorrent (tested on the latest version 2.2), while the third one is for PHP. Hidden Effect. Before proceeding, turn up the volume on your speakers or wear your headphones. In the μTorrent window, go to Help –> About µTorrent. In the dialog box, start clicking around except the buttons. You’ll find the Easter egg in only one location. And, I’m not telling where. But, trust me when I say this one’s not scary. Game for Bored Downloaders. μTorrent developers have included a classic game in their product. Downloading from a torrent can take some time, and you might get bored, so the game is a great way to spend your waiting time. Find the classic game in Help –> About µTorrent. Press CTRL+T to start playing. Hidden Creature in PHP. The developers of PHP have included their favorite beast into one of the world’s favorite scripting languages. This egg, however, works only in PHP version 4 and will work in any website that uses PHP4. (Okay, okay. Some folks have reported that this also works in some versions of PHP5; so, I wish you luck in your hunt.) To see the egg, find a website that serves pages with the .php extension. Then, on the URL bar, add this string at the end of the .php extension: “?=PHPE9568F36-D428-11d2-A769-00AA001ACF42” (do not include the quotation marks). It seems that this egg reveals variable creatures, depending on the PHP version used by the server. Sometimes, it displays the PHP logo. 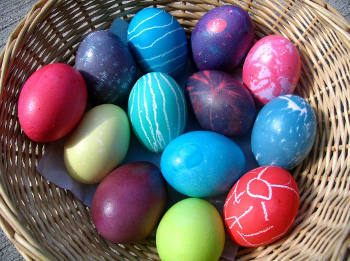 If you enjoy hunting for Easter eggs in software applications, be assured that there are hundreds of them lying around. The fun part is in finding them, or even in following the clues left by those who found them before you. Tip: Google can help you with the clues. Enjoy the hunt! Elmer M. is a full-time author and a part-time geek. His main preoccupation these days is his website about generosity, thoughtfulness, gift giving, and gift ideas for the thoughtful giver. Find gift ideas and learn the art of finding the perfect gift at Elmer M.'s Perfect Gift Tips website. But why did they give this phenomenon such a poetic name – Easter eggs? It means that every software can have if to look in depths? That’s really amazing! Great site indeed. Thanks friends.